Egypt, 1978, 133 minutes, Colour. Youssef Chahine began directing films in 1950 (he was born in 1926). After studying in Egypt, he moved to Los Angeles and Pasadena for two years before returning home and beginning a direction career – which went into the early years of the 21st century, his making a sequel to Alexandria – Why? in 2004. The film is autobiographical, tells a variety of stories about the city of Alexandria, has a great deal of local colour. His storytelling style is particularly of the Middle East, not the linear kind of expectations from western films. However, he made an impression with this film and won a special Jury Prize and Silver Bear at the 1979 Berlin film festival. He continued to make a number of films in Egypt over the decades. One of his more provocative pieces was his section of 11/9/01, the compendium film with eleven-minute segments by a variety of film directors. His particular segment is ambiguous in its presentation of an Arab perspective as well as an Israeli perspective. 1. The impact of this Egyptian film? 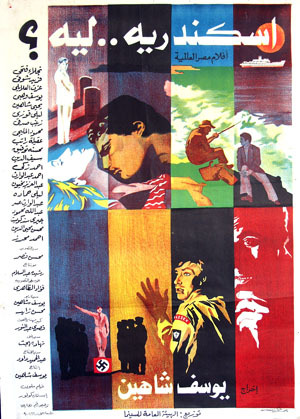 Aspects of Egyptian film-making and production in the seventies? 2. The American influence on the Egyptian industry? The seventies? The memory of American influence in the forties? 3. The background of British occupation of Egypt? The hostility to Britain? The anticipation of German attack and occupation? The reliance on the Americans? The Egyptian lifestyle, especially of the affluent families of Alexandria? 4. The World War II setting, the use of newsreel material? Its inclusion in the credit sequences - with the popular American songs of the forties and sequences of Esther Williams? As viewed by people in the cinemas of Alexandria? As incorporated into the action of the film and juxtaposed with coloured re-enacted material? An authentic feel for the war in Africa? 5. The situation of 1942? the British and their presence, hostility towards them, the merchants relying on the British presence, English curricula at school? The partisans and their hostility and plans to capture Churchill? Australians and New Zealanders present and their rowdiness with fights in the cinemas, singing in the cabarets? The threat of the Germans' advance? Political situations? The Jews and their having to leave? Evacuations? The inevitable brutality and fear? A portrait of Alexandria at the time? 6. How well intermeshed were the various strands of the personal stories? The brevity of so many sequences and the way that these were edited together? Audience sympathy for the characters, how well did the audience get to know them, appreciate them? 7. Yehia as the focus of the film? An engaging character, his age, enthusiasm? As a type? Seeing him within the family circle, at school? The poor family and living above the cabaret, his study, family discussions etc.? his love for American films and knowledge of them, watching the M.G.M. musicals? His popularity with his friends and yet his inability to go to the party because of his torn coat? his charm, acting ability? The sequences with the picking up of the girls? Study, his enacting of Hamlet and the impression that he made on the boys, on the teachers? His desire to act? The build-up towards the musical, the Princess's patronage, the dismal failure? His working in the bank and his distress and frustration? The hopes for Pasadena and the future? How well did he relate to his family, the sequences with his father and his father saving money for him, his friends? Audience identification with him, seeing Alexandria through his eyes? The portrait of his mother and her elegant concern for appearances, his father as a failed lawyer and people's comments on him? The rest of the family? 8. His putting on the play at school and its importance for the British ambassador being present? The merchants? The device of the acting of the sketches and the intercutting of real material of Rommel's advance, Churchill's presence, the partisans and their wanting to capture Churchill? 9. The background of the family and their poverty, making ends meet, trying to cope in Alexandria? 10. The contrast with the merchant family and their wealth, seeing them at work, Mohsen and his opportunities and studying abroad? Mohsen's uncle and his place within the family? 11. Mohsen's uncle and his homosexuality, his capturing of soldiers, killing them? His fascination with Tommy, the bond between them, love, Tommy going back and his letters and war experience, his death and the presence in the cemetery at the end? 12. The sub-plot of Ibrahim and Sarah? A strange match? Sarah's Jewish background and her father? Ibrahim and the terrorists? The child, Sarah's leaving? the letters from South Africa? Ibrahim's imprisonment and trial? Sarah's comments about Israel and the viewing of war in Israel as well as the comments about the coming decades? The return after the war? Yehia's father and the trial, not taking the money? 13. The presentation of the musical, its failure and its chaos, the Princess and her patronage and regard for Yehia? The character of the Princess, the character of the teachers? 14. The director's love for cinema, American cinema and its influence? The staging of the American musical styles? Yehia's dreams? 15. The passing of the war and Alexandria virtually being untouched, the life in the bank, the frustrations and the sudden transition with the letter from Pasadena? The haste, the raising of the money, everybody cooperating, the hurry to the ship and the farewells? 16. Themes of a young man's dreams, opportunities, optimism? A genial film?